What vegetables you use depend on what you have handy … as it’s a one-pot dish and the garden is bursting with all sorts of good things, I used broad beans, peas, carrots, baby new potatoes and (the second time around, not shown in the picture below) French beans. The timings I’ve given are for fresh vegetables, in somewhat rough and ready measurements. A few more or less won’t affect the overall dish. It’s fine to use frozen peas and broad beans. Just defrost them first. This is adapted, with a few minor changes, from a Riverford recipe. Please don’t be tempted to thicken the sauce, it would spoil it. Just scoop into bowls and provide spoons alongside the knives and forks. And that bread. Bring a pot of lightly salted water to the boil, add the broad beans and blanch for one minute. Remove, cool under the cold tap and once cool enough to handle, slip off the skins. Set aside. Heat the oil in a large heat-proof casserole or deep frying pan,one with a lid. On a fairly high heat, quickly fry the chicken pieces in batches until golden brown on both sides. The aim is to colour them, not cook them through. Remove and set aside. Reduce the heat and in the same pan, fry the onions gently until golden brown, then add the garlic and cook for two minutes more. Add the cider, bring to the boil and let it bubble for five minutes. Put the chicken back in the pan and add the bay leaves and stock. Season, reduce the heat and simmer for 15 minutes. Add the potatoes and simmer for another 15 minutes with the lid on. Now add the diced carrots, broad beans and peas, the mustard and cream and cook for another five minutes. Check that the chicken and carrots are cooked through and if not, simmer a little longer. Stir through the tarragon, check the seasoning, and serve. 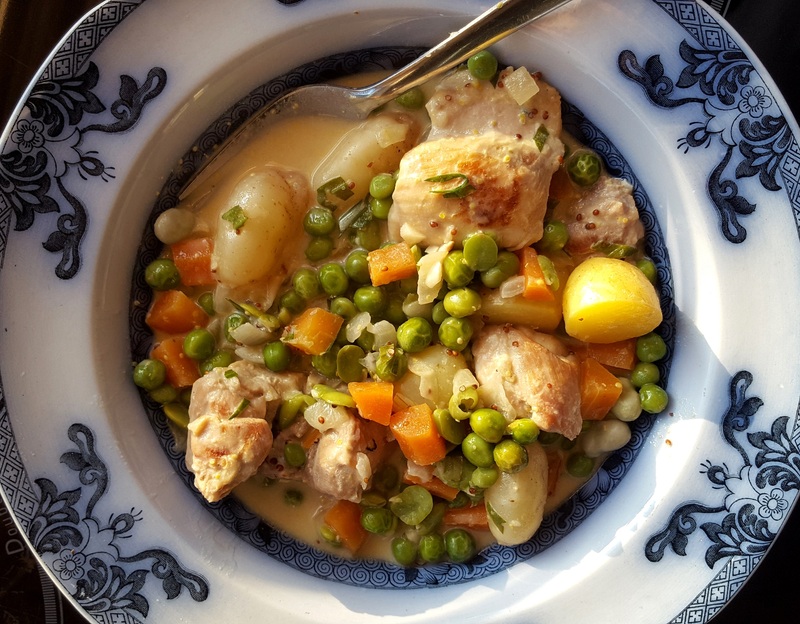 This entry was posted in Chicken and other poultry, Mains and tagged chicken with summer vegetables, one-pot meals by Linda Duffin. Bookmark the permalink. Great way to start the weekend. Yummy, just what I like in a perfect chicken sauce: cider, mustard, tarragon & double cream! Great with pork chops, too and if we had not had those with that wonderful sauce (though no cider) on Wednesday, I’d be running out to get a chicken asap. Glad you like it, Nicole, hopefully a case of great minds thinking alike. 🙂 Have a great weekend. Oh yes! And I agree with Stefano, that a really good chicken is hard to find. We were spoilt in France, when they were killed to order, and delivered to us complete with giblets and scrawny head. I quite liked that somehow, it seemed more respectful to the creature to have it sent intact – apart from feathers of course. Sutton Hoo chickens: hi Linda, I finally purchased and cooked a SH chicken: they are very good indeed, the best in many years actually. much better than any supermarket organic chicken. I found it at one on my local, less posh butchers at a reasonable 7.50/kg, which I was happy to pay.